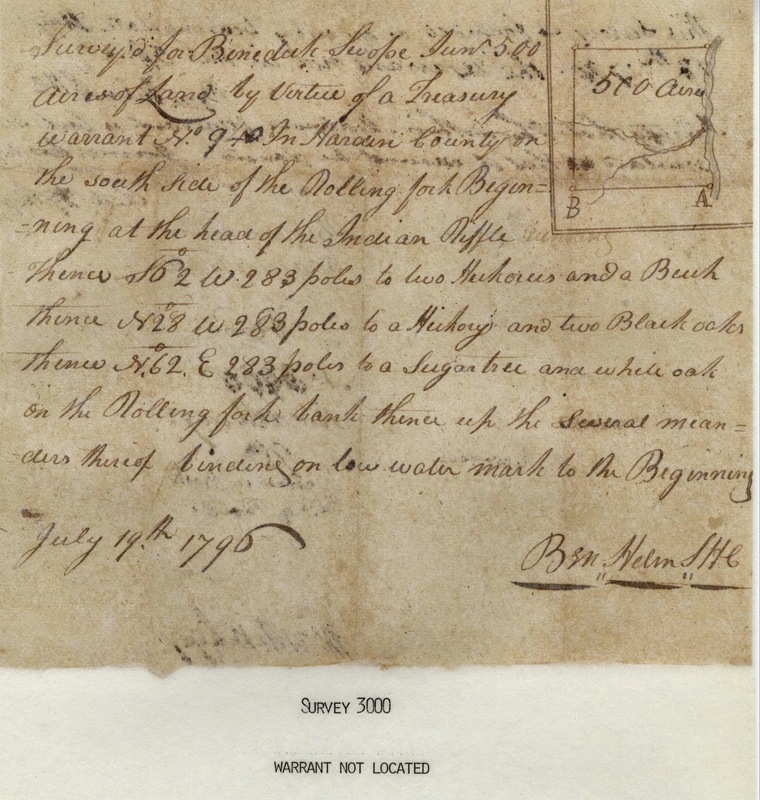 For Memorial Day, we have decided to highlight land patent research for VA-KY Revolutionary War Veterans. 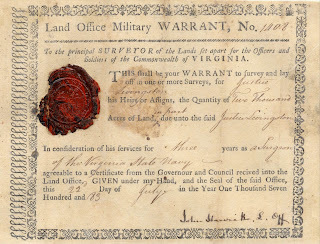 Land patent and bounty research of our ancestors is a great way to show their contribution and war service. Kentucky,separated from VA, was admitted as the 15th state, 1 Jun 1792. So early researchers may find their VA - KY Revolutionary War ancestor’s land warrants on the Kentucky Secretary of State website: Revolutionary War Warrants Database. Step 1. Where to begin? Visit the Kentucky Secretary of State website. We have had wonderful success on the Virginia and Old Kentucky Patent Series, where researchers can access patent images using a “name” database. There’s also the Index forVirginia Surveys and Grants posted by the Kentucky Historical Society online. Tracing the deeds may be possible using online databases as that in Edmonson County, KY where images of the deeds are available. At a3Genealogy, if needed we use Deed Mapper to help us identify and track land descriptions. 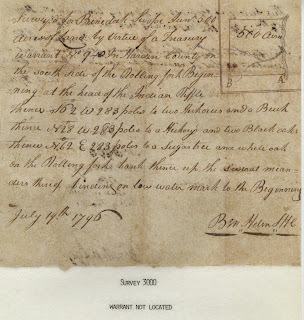 But even with metes and bounds and the lack of official surveys and platted land maps, you can uncover the general area of your war veteran and ancestors’ Kentucky early settlements. Visit here for Metes and Bounds Primer for Genealogists. Step 3: Ready to Walk Ancestor’s Land? Once researchers have traced the early land patent to the current owners, we have found that the local Property Valuation Administrator (PVA) office is the best resource to mapping current day location. 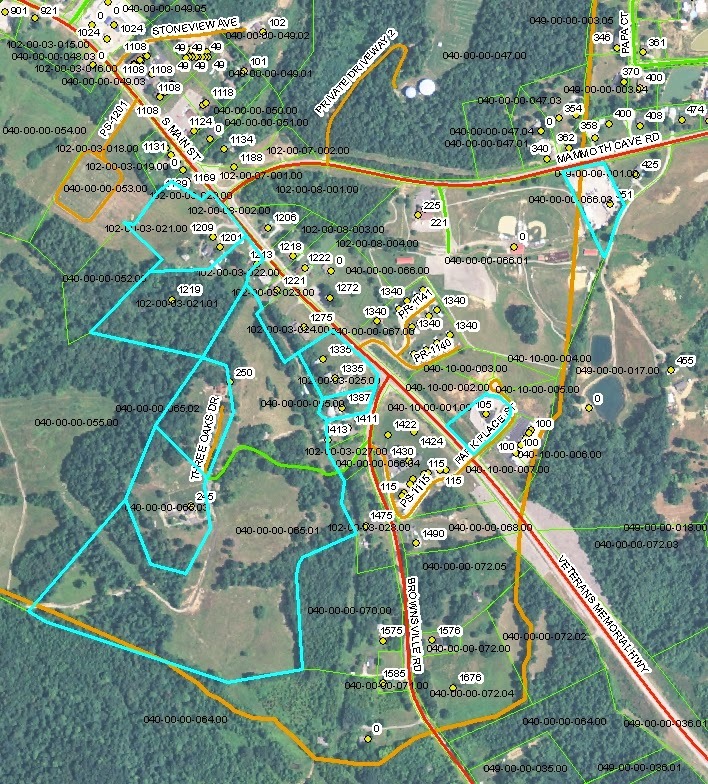 In Edmonson County, KY the Property Valuation Administrator (PVA) office aerial maps were used for outlining the original land patent of a recent client. However, for a “forensic genealogy” case in the same area, we used a property title search company / attorney with a surveyor to verify our findings and certify land boundaries for a court case. This however, is an expensive solution for genealogical research. There is also an online tool for ancestral researchers who wish to do the current-day mapping work themselves. After you have traced your 18th century patent to today’s current owner researchers may wish to visit qPublic.net. If map aficionados and “deed tracers” haven’t used this tool, you are missing a genealogical treat! 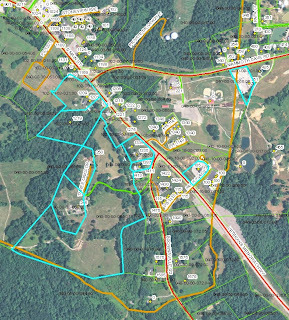 It is available in many counties across America and is such a life-saver when working with metes/bound land descriptions from Napa, California to Kentucky. 1) Deeds may not be readily available on line. More than once we have had to use our a3Genealogy Kentucky deed experts to ferret original patents and trace the deeds. However, our Revolutionary War patent projects have thus far been 100%. To trace these patents to current day, however, requires research in wills, probates and minute books. 2) You may wish to not have an aerial map (birds-eye) view. For these clients we use Google Maps, but in some rural areas, exact locations may not be discernable on the map. Yet, an overlay from historical maps using Google Maps is an acceptable tool. 3) From the original patent to current day the watercourses have shifted and the descriptions vary from one owner to the next. It’s not exact. Be sure to widen your deed trace to include neighbors. Few have paid for official surveys. However, this is changing due to boundary disputes. As we celebrate our war veterans, have a safe Memorial Day. And let’s not forget our Revolutionary War soldiers laid to rest in the most remote locations. Slave Death Records Before the Civil War?